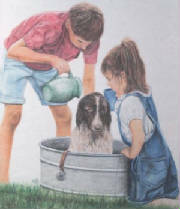 This a pastel drawing of two kids bathing their dog. It's 21x24 and comes in a hand-made, barnboard frame with a white, wooden mat. Contact me to purchase unframed. 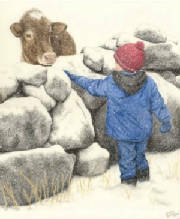 Coloured Pencil - "Best Buds"
This is a cute colored pencil piece of a little boy with his two kittens. 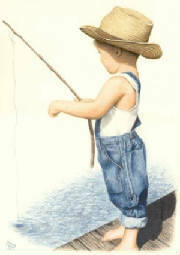 It's 14x22 and framed in a hand-made, gray, barnboard frame, which matches the gray kittens, and it has a hand-painted blue mat which matches the little boy's overalls. 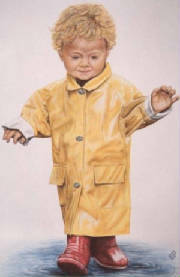 This is a fun piece of a little boy doing what so many kids do, and even what we did when we were young; catching snowflakes. It's colored pencil with snowflakes done in acrylic paint. It's 14x16 and framed in a hand-made, gray, barnboard frame, with a hand-painted blue mat to match.